Passport/Visa Requirements: Passports and return tickets required for citizens of U.S. and Canada. Languages: German. Many Berliners speak (or at least understand) English. Turkish is also widely spoken. Time Zone: 1 hour ahead of Greenwich Mean Time (+1 GMT). Six hours ahead of EST. (+6EST). Daylight Saving Time is observed from the end of March to the end of October. 20 years after reunification, this exciting world capital is buzzing with confidence, sophistication and style. From the cutting-edge skyscrapers of Potsdamer Platz, to the ambitious renovation of its World Heritage-listed Museum Island, to the gleaming glass dome crowning the Reichstag, Berlin has been reborn as a major center of art and culture. The city has had a lot to overcome: its former status as the center of Nazi power, the ravages of World War II, the repression of Communism and the surrealism of being a half-communist, half-capitalist city, divided by a wall that was an iconic symbol of the Cold War. 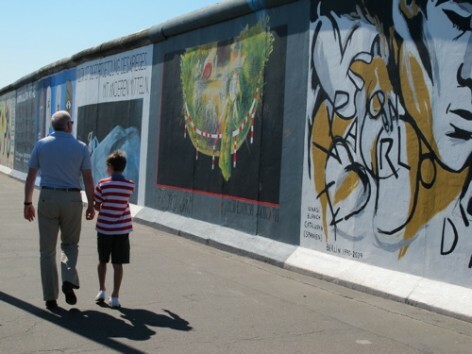 None of this has been forgotten – there are museums and monuments dedicated to the horrors of the Holocaust, the SS and the Gestapo, and to the attempts made by East Berliners to escape beyond the wall. But Berlin would prefer emphasize its greater history (including Prussian rulers like Frederick the Great), and showcase their embrace of modern art, architecture and design. Perhaps the most powerful example of this is the Reichstag. This historic building was the seat of the German parliament from 1894 to 1933. After the wall fell, and Berlin was once again named the seat of the government in 1991, the Reichstag was transformed into a masterpiece of eco-friendly modern architecture, while maintaining the Neo-Classic façade that reflects its rich heritage. It’s an approach that defines 21st century Berlin – pragmatic, energetic, respectful of the past but always moving forward. My family and I spent three incredible days in Berlin, and I was so impressed by all I saw and discovered. The museums are truly world-class, right up there with the Louvre and the British Museum – exploring the collections on Museum Island could take a full three days by itself. The contemporary art scene is drawing international attention, while Berlin’s sophisticated taste and passion for quality make it a fantastic place to shop. And the city’s history and diversity is fascinating – on our guided tour, we visited a quaint medieval village, World War II monuments, trendy districts and historic churches. We dined at the rooftop restaurant under the Reichstag dome, saw the famous bust of Nefertiti at the Neues Museum, and passed notorious Checkpoint Charlie. We were hoping to visit Sanssouci, Frederick the Great’s lavish summer palace in Potsdam, but we’ll have to save that for another visit. As it was, we had more than enough to fill our days. If you’re a history buff, Berlin is your dream come true. If you like classical or modern art, avant-garde fashion and vibrant nightlife, Berlin has that too. And your kids will love the fairy-tale palaces, boat rides on the canals, and polar bears and pandas at one of the world’s best zoos. No wonder Berlin is such a hot destination right now.